Komárno was built in the southern corner of Žitný ostrov (the territory situated from Bratislava to Komárno bordered by the rivers Danube, Small Danube and Váh from the Eastern side) at the confluence of the rivers Nitra, Danube and Váh. The town is one of our oldest towns with the rich history, cultural tradition and economic development. Its importance was predetermined particularly by its advantageous geographical position. The ford usable in each season of the year was created at the confluence of the rivers Danube and Váh thousands years ago here. The routes leading from the valley of the rivers Váh, Nitra and Žitava crossed the international commercial route leading along the southern bank of the river Danube. The conditions for the establishment of the monumental architecture in the Carpathian basin were created in the end of the 10th century. The basis for the state established at the turn of the millennium were the regions with their seats in the newly built castles and centres of the castle domains. The view of Komárno from the bridgehead of St. Peter. On the left side of the picture is the view tower. King Stephen created the county-system of the kingdom and fixed the castle of Komárno as the centre of the county. He was given the crown at his own request from the Pope Silvester II; he was crowned at Christmas in the year 1000. Many among the kings from the Árpád dynasty stayed in our town and its surroundings. Several of them confirmed or extended the privileges of the town. St. Ladislas, the king-knight did so, whose robust figure required respect: „he was a head taller than the others ...“. His successful expeditions in the East protected the Christianity and the european civilisation from the pagan tribes invading the Carpathian basin. He was replaced in the throne by Koloman I. His laws were much different from the reactionary laws of the contemporary monarchs. He was attributed the statement „...and witches do not exist...“ (by this statement he meant the witches able to turn to the animal). In the middle of March 1241 Tatars proceeding from the inland of Asia overcame the mountain - pass Verecke and with the huge troops invaded the Carpathian basin. They defeated the army of Belo IV on April 11th near the river Slaná and after one year of ravaging the country they left it in March 1242. The loss of life was huge, almost half of the 2,2 million inhabitants perished. However, Komárno had not been defeated. After the invasion of the Tatars Belo IV. supported the building of towns. In a short time, he gave significant town privileges to twenty-five villages. In 1265 from the union of three villages the town of Komárno was established („villa St. Andreae, villa Camarum, villa Kezu“) which was awarded the same town privileges as the town Buda (the capital of Hungary). Louis the Great, the ruler of Hungary and Poland, visited frequently the forests near to the town and spent his free time with hunting and fishing. Louis was the first king who encountered successfully the Turks, however, the Osman Empire had not been powerful enough to invade Europe. By his foreign policy the king gained the leading part of his country in the region of Central - Eastern Europe. Sigismund of Luxembourg spent the most significant period of his reign in the castle of nearby Tata (Hungary) where he arranged the luxurious court. In 1417 he confirmed and extended the town privileges of Komárno. As the German and Roman emperor and the Hungarian and Czech king he enjoyed the big power of the ruler applied within the framework of whole Europe. 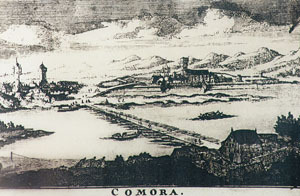 The Komárno Castle in 1595. The coloured copperplate made by Jacob Hoefnagel. During the reign of Matthias who ruled from 1458 as Matthias Corvinus Komárno was living its days full of joy. Without his enthusiasm for science and art the expanding of new ideas of renaissance and humanism would be hardly imaginable. The building activity is increased in the whole country. „How can I remember these great churches and palaces which you had erected in Buda, Székesfehérvár (Hungary), Visegrád (Hungary) and in Komárno ? How can I express your pleasure while looking at significant buildings particularly at those imitating the old examples ?“ as Bonifini, the historian of the court, writes in one of his works. Komárno received many important privileges from Matthias Corvinus. The battle at Mohács on 29th of August 1526 ended with the victory of the Turks. The sultan occupied Buda in 1541 and the country was divided into three parts: the Hungarian Kingdom, the territory occupied by the Turks and the Transylvania Principality. The whole territory of the medieval Hungary was liberated only in 1718 after the peace concluded at Požarevac. In 1544 King Ferdinand I ordered the reconstruction the castle. The Old Fortress was built on the pentagon ground plan according to the plans of Pietro Ferrabosco in the years 1550-1560 in the territory between the rivers Danube and Váh. 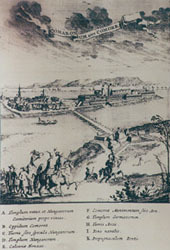 It was extended with the New Fortress in the middle of the 17th century and the Palatinus and Váh fortification lines were added. Together with the Danube Fortress, Monostor and Igmand Fortresses (nowadays situated on the territory of Hungary) the biggest fortification system of the Austro-Hungarian Monarchy was established and from the military - strategic point of view it was the one of the most significant fortification systems of Europe of that time, capable to admit 200 000 soldiers. The Roman-Catholic Church of St. Andrew. On 6th of March 1749 the Queen Maria Theresia granted the town the status of a free royal town in a velvet, rich decorated document. This already long time awaited privilege providing for the highest town status guaranteed the further development of the town and released it from the jurisdiction and despotism of the castle commandant. The baroque town was built until mid 18th century and seriously damaged by the earthquake on 28th June 1763. In the years 1767, 1768 and in 1777 another disasters - fires - and in 1768 the earthquake again affected the town. The fortification system of Komárno played the significant role during the revolution and fights connected with the national movements during the years 1848-1849. The castle under the command of general George Klapka gave up as the last one to the predominance of the Austrian troops supported by the Russian army - while the advantageous conditions of the capitulation. The vast majority of the town was in ruins after the fights. 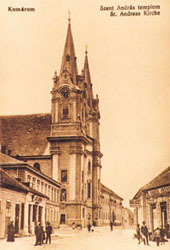 After the federalisation of Hungarian and Austrian part of the Monarchy („Ausgleich“) in 1867 the town flourished again. The new houses and public-administration buildings were built, the town become even more beautiful. 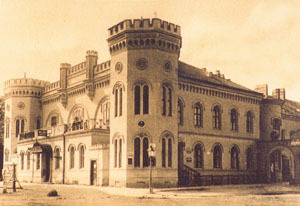 The Zichy palace (1885) and the Town Hall (1885) were rebuilt during this period. The seat of the First Savings Bank of Komárno (1884), the building of Local Savings Bank of Komárno (1902), the Benedictine Secondary School (1908), the building of the Palace of Justice (1912), the Cultural Palace (1913), the new wing of the Benedictine monastery and the Elizabeth Bridge connecting the northern and southern part of the town (1898) were also built during this period. This promising development of the town was stopped by the outbreak of the World War I. The building of the former Officers´ Pavilion. Within the meaning of the Trianon Peace Treaty after the World War I the Austrian - Hungarian Monarchy was partitioned. The northern part of Komárno was annexed to Czechoslovakia in 1918 being degraded from county to the seat of the district. According to the decision of Vienna Arbitrage of 2nd November 1938 the town was repeatedly added to the Hungarian Kingdom and it received the status of the seat of the county. The peace treaties finishing the World War II annexed the town again to Czechoslovakia and it became a seat of the district since that time. It belongs to the independent Slovak Republic as of January 1st, 1993. With its forty thousand inhabitants it is the social centre of almost six hundred thousand Hungarians living in Slovakia.